Floor Stenciling is easy when you follow a few basic guidelines! If you properly prepare the floor to be stenciled and use the proper tools and techniques, your stenciling project should be a fun and rewarding experience. Not to mention how much money you can save with DIY stenciled floor tiles. Properly painted tile floor wears very well. Any mistakes are easily correctible so let's go and stencil that floor! You can create a tiled floor look with tile stencils by painting over your old tile, linoleum, concrete or wooden floors. Make sure that the floor that you'll be stenciling is properly prepared! It makes no sense to put your beautiful artwork over a poorly prepared surface. Floors should be clean, dust free and in good condition. Clean your floor with TSP or similar grease cutting cleaner and make sure it has fully dried before priming. Any cracks or chips should be repaired, filled, caulked, primed and painted prior to stenciling. When stenciling, we usually use a low tack painters tape such as 3M blue tape to avoid pulling up any base coat paint. Never mask over freshly dried paint - the tape will pull it up. Mask off the baseboards, and those surfaces that will not be stenciled Burnish (rub down) the edge of the tape for a cleaner line with less paint seepage. Always remove your masking tape slowly, pulling it an an angle. It is super important that you use a Bonding primer such as STIX, Kilz or Bin to make sure that you get proper adhesion to your floor regardless if you are stenciling existing tile, vinyl, cement or plywood. You can even have your paint store tint the primer so it's closer to your base coat color. Apply 2-3 coats with a tight nap roller (1/4" - 3/8") or even a dense foam roller for a smooth finish and good coverage. You can lightly sand off any small imperfections before applying your base coat but try not to sand through the primer. Let the primer dry fully before applying your base coat. Use a good quality flat sheen base coat paint. Any good latex or acrylic wall paint will do. Durability is achieved when you prime your tile floor with adhesive primer and later add a protective coat of clear polyurethane after your stenciling is complete, so don't worry about your base coat paint. Apply at least 2 coats with a tight nap roller (1/4" - 3/8") or even a dense foam roller for a smooth finish and good coverage. Base coat paint should be allowed to dry for at least 24 hours before stenciling. Using a good quality repositionable spray adhesive makes stenciling your floor easy and gives your prints crisper edges. Always apply your spray adhesive in a well ventilated area. Mist the back of the stencil and let it dry for a few minutes so the adhesive tacks up. This will prevent any of the spray adhesive from transferring to the floor surface. Reapply adhesive as necessary during your stenciling project. It is always a good idea to test your stenciling technique and color selections before starting your project. You can test your stencil and colors in a discreet place on your floor but it's best to make a sample board. You can use a piece of cardboard, a pizza box, a piece of sheetrock or a piece of plywood for your sample. You'll need to base coat the sample material in the same paint as your floor. Then you can do a few prints to get comfortable with your technique. You can also test the sample in different areas of the room to see how light might affect the color. And finally, you'll have a sample that you can bring with you when shopping for fabrics and furniture to go with your beautifully stenciled floor. If you are stenciling over existing tile you simply need to center your stencil on each tile. No need to use the built in stencil registration. Your pre-existing tile will dictate the placement. 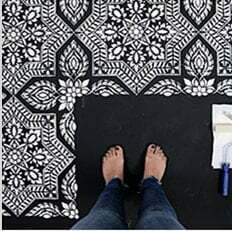 But if you are stenciling a plywood, linoleum or cement floor you will want to position your stencil in a way that full tiles are in the most visible area (like as soon as you enter the room) and any cutoff tiles are hidden in the back and corners of the room. You may want to use a light colored chalk line or chalk pencil to give yourself a basic grid to follow so your rows stay square. This is a super fast way to get the job done. Pour your stencil paint into a tray or plate and EVENLY load your Dense foam roller by rolling it a few times back and forth through the poured paint. We don't want a blotchy looking roller. Once your stencil roller is evenly saturated with paint, off load the excess paint by rolling it a couple times on folded paper towels. If the roller leaves stripy lines on the paper towels, reload the roller so it's evenly coated and then off load it again on your folded paper towels. The roller should appear somewhat dry. It's always better to have less paint on your roller because too much paint can cause paint seepage under the stencil. Start rolling and slowly build up paint coverage using light to medium pressure. Don't push too hard as this can cause paint bleed under the stencil. Carefully un-tape and pull back a corner of the tile stencil to see if your paint coverage is satisfactory. Continue stenciling. Reload and off load the roller as necessary. Carefully remove the finished Tile stencil and use the built in registration to align your next stencil repeat. If you're stenciling over existing tiles, simply center the stencil on your next tile. Most Cutting Edge Stencils have a built in registration that makes alignment easy and intuitive. This means that the stencil aligns with previously stenciled elements. Alignment diagram is shown in the stencil's description on our website. Use a flat base coat paint. Use a flat stencil paint like “Ben”. Make sure the surface is smooth without a texture. Don't overload your stencil roller and build the paint coverage up slowly, without pressing hard on the roller. Use spray adhesive for even crisper edges. Minor mistakes and bleed can be wiped off with baby wipes or moist rag while the mistake is still fresh. Alternatively, the mistakes can be touched up later with a small brush. Use a stencil brush when you can't use a dense foam roller, when you are are using a stencil with small openings or for multicolor stenciling. Using a stencil brush works great for shading and also for tight edges and corners. Select your stencil brush size based on the size of the stencil openings. The smaller the openings - the smaller the brush. For edges and corners a regular size stencil brush (1/2" or 5/8") works well. Pour your stencil paint onto a tray. Dip the stencil brush tip into the paint (only about 1/8") and then swirl it on the tray to evenly distribute the paint into the bristle tips. Off load the excess paint onto some folded paper towels. Like the roller, the brush should appear almost dry. You can use a light swirling motion for a softer look and for shading. Pouncing (straight up and down motion) works great for filling in areas. When stenciling with multiple colors, use a specific brush for each color to avoid color contamination. Stencil as much of your floor as possible before tackling the edges and corners. Make sure the baseboard is properly masked off using low tack painters tape. When stenciling the edges of your floor, simply position your stencil and then bend it into the crease between the floor and the baseboard. Secure with extra tape if needed. Roll right into the crease. You can use your fingers or even a putty knife to hold the flexible stencil into the crease while you use a stencil brush to pounce color right into the edge. Generally, we would use more than one stencil for a floor project. Not only it makes the project go faster but this also allows you to cut one stencil into pieces so it perfectly fits into the edges and tight spots, instead of having to bend your stencil. This tends to give a great result. In most cases you'll want to protect your newly stenciled floor with a protective clear coat to prevent it from wearing off. We recommend a water based clear urethane coats because they don't turn yellow with age. Apply 2-3 coats for best results using a tight nap roller (1/4"-3/8") or even a dense foam roller. Never shake a can of clear coat as this can introduce air bubbles to the finish. You must stir them slowly with a stirring stick. If you clean your brushes, rollers and stencils as soon as you are done with your project, the paint comes off much easier. Don't soak your stencil brushes for a long time: the natural bristles expand and may split the metal ferrule. Using a drop of brush cleaner or Murphy's Oil Soap works well for cleaning brushes. Using a Brush scrubbing tool helps to better remove paint particles from the brush bristles. Don't let your brushes or roller dry out during the project. If you take a break, put them in a plastic baggie or cover with damp cloth. Your stencil does not have to be cleaned after each repeat. It's time to clean the stencil when there is a noticeable accumulation of paint - usually after quite a few repeats. In our experience, 10-15 repeats or more. Often you'd be able to stencil an entire medium size accent wall without cleaning the stencil. To clean your stencil, lay it on a flat surface such as a cutting board or a cookie tray, spray it with water and gently scrub with a dish brush under running water. Make sure you have a sink strainer in place to catch any paint pieces. If the paint on the stencil is very dry – we call it "caked" – let is soak for a while before scrubbing it. Lay the cleaned stencil onto paper towels and pat or roll it dry with a roll of paper towels – works great! It's not easy to remove spray adhesive from the stencil, but we find that the product called Signature Thread Spray It DK5 Glue Remover works really well. Our stencils are very durable and with proper care and cleaning should last for years! It's best to store your stencil flat whenever possible. We recommend placing your clean stencils between 2 pieces of paper or cardboard and storing them under the bed or even under an area rug! Stenciling is such an amazing and easy technique that opens the doors to endless decorative possibilities! Don't be intimidated - be inspired! Just follow these guidelines, and in no time you'll be stenciling like a pro! Want to learn more about stenciling? Check out our Blog or watch our informative and inspiring How To Stencil Videos!